Many people think (wrongly) that God will answer all prayers and requests in a positive way and therefore cannot understand why they don’t win the lottery or find their love or gain whatever they pray for. This verse is often used in those discussions by people trying to prove that God is just a made up fantasy of man. If God is real and all we have to do is follow this verse, then why are our wishes not granted? 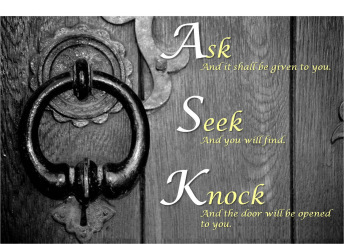 So ask (in prayer) for what we want, and God will answer, sometimes however the answer to prayer is “no” or not the answer that we expect or want. God knows what we need and his answer will be exactly that. Seek what you need to find. Mainly we need to seek the truth and that truth can be found in the Bible. God created the Bible as our guidebook or roadmap to His truth. Only by seeking His truth can we know the way to Him. And knock, never stop knocking on His door. He will open it for you, He wants you to join Him inside. Sin came into the world and closed that door, but if we push sin from our lives, the door opens and God welcomes us back inside. Are you still trying to find your way to Him? The Bible shows you many times the things we must do. This is just one short verse. If you’re looking to have a verse or passage explained in a future post, send me a not with the chapter and verse and it may appear in a future Sabbath posting. Previous Planes, Trains & Automobiles &?